Virt-manager is not part of Xen, but it's developed by Redhat and included in Fedora, and it can be used to manage Xen hypervisor, among others. Before trying to install new guests using virt-manager make sure you have installed virt-manager and its related packages. This tutorial was done using a Fedora 13 host, installing a paravirtualised CentOS 5.5 x86 (32bit) domU. However, it should work fine for other Fedora/CentOS releases. and let Yum sort out the dependencies. First verify the name of your LVM volume group. 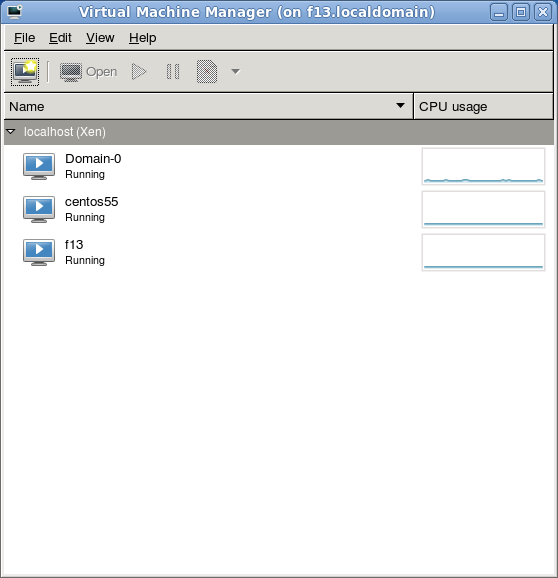 The LVM volume group was set up during dom0 host installation. In this example the LVM volume group is called "vg_f13" and it has 371.75 GB of free space in it. = Starting the Install Now, let's start the graphical virt-manager. And then virt-manager window will show up on your graphical desktop. if the virt-manager is not running on the same machine as xen : check "Connect to remote host" and fill in the connection information. Now you should see "xen" tree with installed domains. Enter the name for the guest - We're using centos55 for this. Choose: "Network install (HTTP, FTP, or NFS)"
Enter the CentOS mirror URL: http://ftp.funet.fi/pub/mirrors/centos.org/5.5/os/i386/ - You can choose a different mirror, ideally one that's geographically close to you. Accept the default values for RAM and VCPUs (512 MB and 1 vcpu) and click Forward. Choose "Select managed or other existing storage"
Enter the path to the LVM volume to the text field or choose browse: /dev/vg_f13/centos55 - This is the LV that we set up earlier. Change "Architecture" to "i686" as we're installing 32bit PAE guest VM. Make sure the Network selection has "Virtual network 'default': NAT" selected (it is as a default). Virt-type should be "xen (paravirt)"
"Creating virtual machine" window opens, and virt-manager fetches the kernel/initrd from the mirror site. 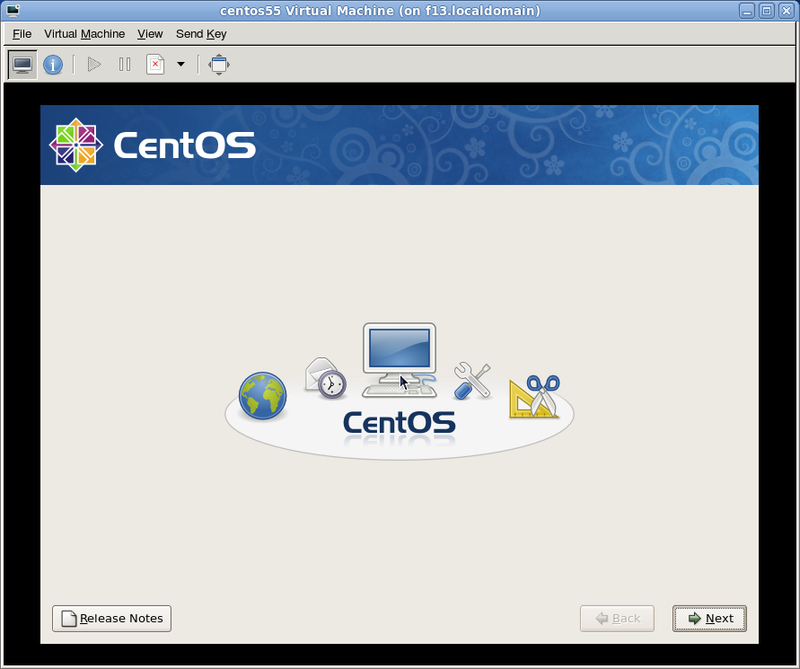 New window opens with the guest VM console in it, and the CentOS5 installer starts. Choose "dhcp" for IPv4 networking and you'll get private IP from the dnsmasq service running in dom0. Network connections from the guest VM will be NATed to the internet. Here you can see the guest called "centos55" has ID 1. Interface "vif1.0" (the first network interface of the guest with ID 1) is attached to the bridge "virbr0" - the bridge that dnsmasq is serving and providing DHCP server and NAT service. Install CentOS 5 as usual. Note: This can be done over an SSH connection if you enable X11 forwarding.